The Fort Worth and Rio Grand Railway was chartered to build the first rail lines from Fort Worth to Brownwood in 1890. In 1901 the St. Louis and San Francisco Railway Company (FRISCO) acquired and controlled the roadway, but the Fort Worth and Rio Grand continued independent operations of the freight and passenger train. FRISCO constructed the Comanche Depot. In 1950, the passenger and freight service operations were discontinued, and in 1959, sections of the railway were abandoned. The building was used primarily as a storage facility by the City and eventually the railroad granted ownership of the depot to the City. 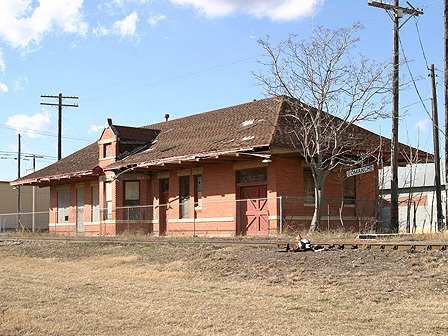 The 1912 passenger depot and platform, constructed of brick on a concrete base is threatened by deterioration and a failed roof system. Comanche is a rural community and lacks the revenue to restore and repair the neglected building.